These Paintings can be viewed in step form. 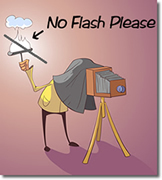 Please click the below images and it will take you to a personal page on each portrait. This is the completed Pastel Portrait created from the photo below. Usually I do not have a good photo reference to go by. I often must create a commission from many photos to create one that is pleasing to the client. This is the framed portrait. Often framers will add white matting around the pastel artwork before framing. Pastel Portraits must never be transported on the face as the pastel falls on the glass. Pastels must be hung away from direct sunglight. Often there is a need to create the right backdrop for the mood of the painting. Even with the amount of explicit information this reference photo gave me I still found the need to alter the background in order to create a peaceful backdrop. The children in the background of the photo were detracting from the viewers eye centering on the face of "Abby". This is a pastel portrait in the size of 45x60cms. Much later the owner framed it under glass. Framing is not a service I provide but I was able to provide the photo to give you an idea of how the painting looked complete. 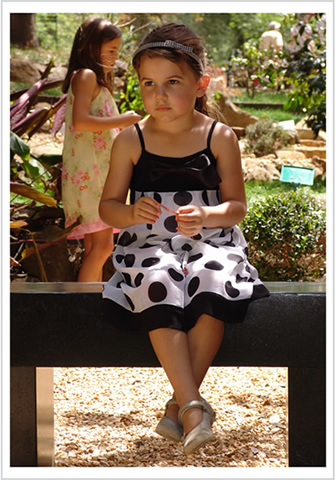 More information on how to take the best photos for a portrait can be viewed on this link...... Taking the Photo! 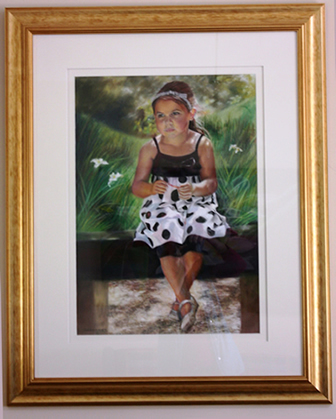 The best childrens or family portrait painter is important to commission as Memorable Portraits mark the milestones in a child's development from babies and children through to teenagers and adults. Birthday parties,weddings,first day at school,graduations,their first pet-dog or cat,sports or academic achievements can be made a momentos occasion with a heirloom portrait that can be kept for posterity. Often times photos fail to capture all that needs to be said about the child as in their hobbies,interests and endearing habits. Where a photo of a family often fails to capture all the children in the best expressions a group portrait easily expresses the loving unity of a family. Design your individual custom made portrait to suit your taste by choosing the materials you want the created in ex. oils,watercolour,pastel or charcoal. Decide how many portraits are to be included in your artwork and what size your want your painting to be. Ring: 0488288512 to discuss this with the artist or Email: ozportraits@gmail.com sending the photos to best help the artist meet your needs. 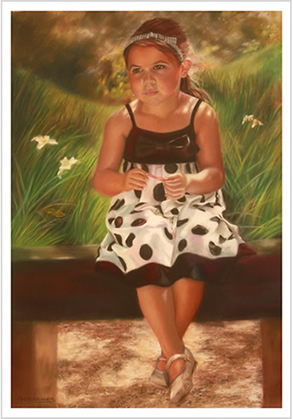 Canvas Portrait Art Painter :Commissioned portraits for adults, babies, children, teenagers and pets are available in oil painting portraits or pastel painting portraits or charcoal portraits.Selecting the best top portrait painter to create your commission is an important decision. Canvas Art Oil Portrait Paintings of single corporate portraits and institutions are also available as are family groups and group corporate portraits. Portraits are usually portrayed in a realistic representational style but can be tailored to meet the requirements of the client. Whether your desired portrait is for a wedding, memorial, anniversary, birthday, graduation, gift, or just for interior decorating it will be able to be kept as a professional quality heirloom.